Other Regulated Material ORM-E - 3 1/4" x 1 3/8" - 1000 per roll. To bring you our best price minimum purchasing requirements may change without notice. Please call for the most up-to-date pricing on this item. ORM-E shipping labels. 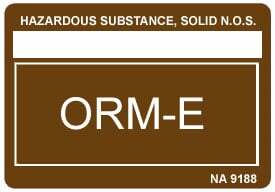 The abbreviation for Other Regulated Material - Class E. An ORM-E material is hazardous waste of a material not included in any other hazard class. The Other Regulated Material O27 is also known as ORM	O27	.